There are few studies that describe neuroimaging [Computed Tomography (CT) and Magnetic Resonance Imaging (MRI)] and Electroencephalogram (EEG) data in children who present with new-onset seizures. The EEG is recommended as a part of the neurodiagnostic evaluation of the child with an apparent first unprovoked seizure. , The role of neuroimaging in children presenting with new-onset afebrile seizures/unprovoked seizure is not well defined. , Insufficient evidence is available to make a standard recommendation or guideline for the use of routine neuroimaging in children with first unprovoked seizure. In contrast, guidelines for obtaining neuroimaging in adult patients presenting with seizure have been published. , In a few studies that have reviewed the yield of neuroimaging in children with unprovoked seizure, the prevalence of abnormalities ranged from 0% to 21%. ,, Although there is ample investigation and data concerning initial management, treatment approaches, and outcomes in children with simple febrile seizures, there is somewhat less well-developed data on Complex Febrile Seizures (CFS). The patients attending the Emergency, in-patient and out-patient Departments of Advanced Paediatrics Division of Sher-i-Kashmir Institute of Medical Sciences from November 2006 to November 2008, were enrolled for the study as per the criteria given. It was a prospective, stratified-randomized cohort study conducted on children in the age group of 6 months to 14 years having first-onset unprovoked seizures and CFS. Children were excluded from the study if the seizure resulted from an acute situational etiology such as toxin, infection, or trauma. They were also excluded if they had a chronic neurologic illness limiting their activities of daily living, such as cerebral palsy, mental retardation, and pervasive development disorders, or had other abnormalities on neurologic examination or had simple febrile seizure. The study was approved by the Institutional Review Board. Parents of the patients signed consent forms before participation. A detailed clinical and developmental history was taken and physical and neurological examination was carried out. Blood samples of all subjects were drawn on admission and routine laboratory studies were performed. Complete blood counts, blood sugar, serum Na + , K + , calcium were analyzed in order to exclude possible metabolic disorder, and to identify a predominant seizure type and potential epilepsy syndrome. The International League Against Epilepsy classification was used to define seizure types. An EEG was performed in all the subjects in the study, using 18-channel EEG machine (Model EE 18) from Recorder and Medicare System. A total of 22 electrodes were placed using children montage. EEG was performed within the first 48 hours of the first unprovoked epileptic seizure. The EEG was analyzed by a clinical neurologist from the Department of Neurology, SKIMS, Srinagar. Computed tomography (CT) scan of head was performed in all the subjects on spiral CT (somatic-emotion from SIEMENS). Cranial MRI was performed on patients who had focal findings in their EEGs and in those where CT findings needed further characterization. MRI was performed at 1.5 Tesla. Neuroimaging CT/MRI reports were categorized as normal and abnormal. Abnormal cranial CT was categorized into volumetric reduction of the cerebral hemispheres, focal hypodense lesions, white matter hypodensity and lissencephaly/polymicrogyria. Likewise, the abnormal MRI was classified into cortical lesions, white-matter lesions, encephalomalacia, enlarged lateral ventricles and volume loss, and miscellaneous group. Data was recorded as percentages. The proportional differences were measured by Chi-square analysis and Fisher's exact test. All the inferences were drawn by using SPSS 15.0 and Minitab Statistical Packages. A prospective study was conducted, which included 276 subjects. Partial seizures were observed in 86/276 patients, generalized seizures in 116/276 patients, CFS in 64/276, and undetermined seizures in 10/276 [Table 1]a, b, [Table 2]. The sample of patients constituted predominantly male in all seizures 162/276 (58.7%); 114/276 (41.3%) were female. Generalized seizure disorder was predominant in both genders. This disorder was present in 72/162 (58.7%) of males and 44/114 (38.6%) of females [Table 2] and [Table 3]. Patients were divided into two groups on the basis of age. Group one was constituted by children aged 6 months to 6 years and included 100/276 (36.2%) patients. Group two was constituted by children >6 years to 14 years old and included 176/276 (63.8%) patients. In the age group of 6 months to ≤6 years, 55/100 (55%) had CFS and 32/100 (32.0%) had generalized seizures. Among children >6 years to 14 years old, partial seizure was seen in 78/176 (44.3%), generalized seizure in 84/176 (47.7%) and only 9/176 (5.1%) had CFS. The age distribution between the seizure types was statistically significant, with predominance of CFS in the age group of 6 months to <6 years, and its least occurrence in >6 years to 14 years old [Table 2] and [Table 3]. EEG abnormalities were significantly low (P < 0.05) among the patients with CFS. 10/64 (15.6%) patients with CFS had such abnormality [Table 4]. Sharp and spike waves, alone or the combination were common EEG findings. In partial seizures, sharp and spike waves were seen in 24/86 (27.9%) patients; sharp waves alone were seen in 19.8% patients and spike waves in 16.3% patients. Asymmetry with sharp waves and spikes was seen in 12.8% patients. In generalized seizures, sharp and spike waves were common, with 24.1% patients having them. Sharp waves alone were seen in 17.0%, and spikes alone were seen in 14.0% of patients. In CFS, asymmetry with sharp waves and spikes was the most common abnormality, seen in 10.9% of patients. In undetermined seizures, the asymmetry wave pattern was seen in 20% of patients, which is statistically significant in our study (P < 0.000) [Table 5]. CT abnormalities were observed in 27/276 (9.8%) patients. In partial seizure, 73/86 (84.9%) patients had normal imaging and 15.1% had abnormal imaging with volumetric reduction of cerebral hemisphere consistent with cerebral atrophy in 4/86 (4.7%) patients, focal hypodense lesions in 6/86 (7%) patients, white-matter hypodensity in 2/86 (2.3%) patients, and polymicrogyria in 1/86 (1.2%) patients. In case of generalized seizures [116/276 (10.3%)], a total of 12 children had CT abnormalities, where cerebral atrophy was seen in 6%, focal hypodense lesion in 0.9%, white-matter hypodensity in 2.6%, and polymicrogyria in 0.9%. In CFS, volumetric reduction of cerebral atrophy was seen in 1.6%, and there was white-matter hypodensity in 10% of patients in the undetermined seizure group. Overall cerebral atrophy was the most common finding in our study group comprising 12.3% of patients [Table 6]. In our study, a correlation between EEG and CT was made. CT abnormality was seen in 27/276 (9.8%) of patients and EEG abnormality was seen in 155/276 (56.2%) of patients. A total of 43.8% (121/276) of the patients with normal EEG had normal CT, while 1.6% (2/121) of the patients with normal EEG had abnormal CT scans. Out of the patients who had abnormal EEG 56.2% (155/276), CT scan abnormality was seen in 16.1% (25/155) and CT was normal in 83.9% (130/155) of the patients, which was statistically significant with P value <0.000 [Table 7] and [Table 8]. In our study, MRI was done electively in patients in whom EEG was abnormal or CT needed confirmation. A total of 157 patients went for MRI, overall abnormal MRI was seen in 32 (20.4%), of which 17 (27.0%) patients had partial seizures, 13 (15.8%) patients had generalized seizures, 1 (10%) patient had CFS, and 1 (50%) patient had undetermined seizures. These observations were statistically insignificant. Out of the 17 patients with partial seizures who had abnormal MRI, 5 (9.8%) had volume loss, 4 (7.8%) had cortical lesions, 3 (5.9%) had white matter lesions, 2 (3.9%) had enlarged ventricles, and 1 (2%) had encephalomalacia. Out of the 13 patients with generalized seizure, 5 (8.6%) had cortical lesion, 2 (3.4%) each had volume loss, enlarged ventricles, and 1 (1.7%) each had white matter lesion and encephalomalacia. One patient with CFS had volume loss [Table 9] and [Table 10]. From our study, a correlation was drawn between EEG and MRI. Out of 155 patients with abnormal EEG, 30 (19.4%) had abnormal MRI. However, 2 patients with normal EEG also had an abnormal MRI. The accuracy of picking abnormality by MRI, when EEG is abnormal, is 24.8%, which was statistically significant in our study [Table 11]. A correlation was seen between CT and MRI. All 27 patients with abnormal CT had abnormal MRI. However, 5 (3.8%) patients with normal CT also had abnormal MRI. Therefore, the accuracy of picking abnormality by MRI, when CT is normal, is 96.8% [Table 12]. We intended to estimate the prevalence of abnormal EEG and neuroimaging (CT/MRI) and, specifically, correlate between the EEG and neuroimaging. Also, the study intended to identify clinical variables (if any) that could predict which children were at high or low risk for abnormal neuroimaging. In our study, EEG abnormality was found in 56.2% (155/276) of patients. Shinnar et al. found EEG abnormality to be present in 42% of patients. Overall, 71% of patients with partial seizures and 70.1% of patients with general seizures had abnormal EEG findings. These findings were consistent with similar observations made by Al-Sulaiman et al. and Doose et al. Similar observations were made by Baheti et al.,  Jasons et al., Gilbert et al.,  and King et al. The EEG abnormality of CFS group in our study was 15.6% (10/64). Similar observations were made by Charuta Joshi et al. and Maytal et al. On analyzing individual abnormalities in EEG, our study observed that sharp wave and spikes (either alone or both) were the most common abnormality observed. Similar findings were observed by Doose et al. and Baheti et al. However, Homer et al. and Doescher et al. observed a focal slowing as the most common EEG abnormality. Neuroimaging (CT/MRI) is a useful tool to determine the etiological diagnosis of seizure. An abundance of such literature pertaining to adult patients exists, some of which report a prevalence of CT abnormalities between 34% and 45%. , In our study, the prevalence of neuroimaging abnormality (CT/MRI) is 9.8-20.4% in children who presented with unprovoked first seizure. This drastic difference we describe underscores the need for different guidelines for the use of neuroimaging in children presenting with new-onset unprovoked seizures. Few studies have reported the prevalence of abnormal neuroimaging in children with first unprovoked seizure. Landfish et al. reviewed 56 patients with new-onset seizure but a majority of patients were younger than 2 years, and the most common seizure type was febrile. Only 16 patients (29%) had new-onset afebrile seizures. A total of 25 neuroimaging studies were done (44% of patients), including 23 CT procedures and 2 MRI procedures, and all were normal, although it is unclear which patients had undergone neuroimaging. The authors recommended that CT or MRI should be reserved for children with a history of unprovoked focal seizures, abnormal finding on physical examination, or focal abnormalities on EEG. Garvey et al. reviewed 99 children with new-onset seizures, excluding the patients with underlying neurologic disorders. Overall, 19% patients were found to have abnormal neuroimaging. McAbee et al. reported that one patient with CFS in their series (5%) had an abnormal CT scan. In a large pediatric study, Berg et al., evaluated 613 children aged 1 months to 15 years with newly diagnosed epilepsy. Nearly 80% had neuroimaging done, and relevant lesions were found in 12.7% of these children. King et al. in a study of adults and children following a first seizure, found neuroimaging results indicating symptomatic lesions in nearly 14% of them. Sharma et al. showed normal neuroimaging results in 83%. Maytal et al. reported that in generalized seizures, 82.5% cases had normal CT scan and 17.5% had abnormal CT scan, whereas in partial seizures, 70.8% had normal imaging and abnormal CT was seen in 29.2%, thus showing overall abnormal CT scan in 21.2% of the patients. The prevalence of abnormal neuroimaging in these studies was in the range of 0-24%. The proportion of children with febrile seizures was in the range of 17-71%. Children with febrile seizures (simple or complex) are at low risk of neuroimaging abnormalities. This finding was consistent with our study, in which CFS were present in 23.2% patients and abnormal neuroimaging was seen in 1.6% (1/64) patients. Partial seizures are commonly associated with abnormal neuroimaging as compared to generalized seizures. A study conducted by Mcbee et al. on neuroimaging with first-onset seizures observed that the frequency of abnormal neuroimaging was higher in focal seizures than generalized seizures in neurologically normal children. Similarly, Bachman et al. also found higher frequency of CT abnormality in patients with partial seizures than generalized and psychomotor seizures. An analysis of our study demonstrated similar trends. We also found abnormal neuroimaging in 15.5% of patients with focal seizures as against 10% of patients with generalized seizures. The frequency of focal hypodense lesion on neuroimaging was much higher in focal seizures (7%) as compared to generalized seizure (0.9%). Overall, common neuroimaging abnormality, both in partial and generalized seizures, was volumetric reduction of cerebral hemisphere consistent with cerebral atrophy, as was shown by Simone et al. In our study, cerebral atrophy was found in 12.3% of patients, hypodense lesion in 7.9%, and polymicrogyria in 2.1% of patients. Although the slight increase in the cortical atrophy in our study was, possibly, due to inclusion of CFS patients. Abnormal MRI results were present in 19.4% (30/157) patients. Abnormal MRI was found in 17 (27.0%) patients with partial seizures, 13 (15.8%) patients with generalized seizures, and 1 (10%) patients with CFS. Doescher et al.,  who conducted a study on a cohort of normal children with newly diagnosed seizures, found abnormal MRI in 32.6% of patients. We attributed this higher percentage to the fact that reporting of MRI in their study was done repeatedly by more than one examiner. In our study, both EEG and MRI were abnormal in 32 (20.4%) patients. However, 125/155 (80.6%) patients who had abnormal EEG, did not show any abnormality on MRI. Two patients had abnormal MRI with normal EEG. So, the accuracy of picking up abnormality on MRI, when EEG is abnormal, is 19.1% by using Chi-square test, which is statistically significant. Our study showed neuroimaging abnormality in 9.8-20.6% patients, with no patient requiring immediate surgical intervention. Similar observation was observed by Sharma et al. We explored EEG abnormalities and specific findings on the MRI. Although in this series the numbers are small, we found that normal EEG did not reliably predict a normal MRI. Because these studies were obtained at the time of first seizure, we are not aware if lesions on neuroimaging (CT/MRI) will predict recurrence of seizure in future. Follow-up is required for determining the significance of the abnormalities found on neuroimaging. Our study suggests a need for continual assessment of the role of neuroimaging in patients with first seizure. Our findings indicate that clinical examination and EEG results are good indicators for neuroimaging, and these can be used as one of the criteria for ordering neuroimaging in New-onset seizures, more so in partial seizure than generalized seizure. This study provides valuable baseline data for a large cohort of children who can be followed up through their developmental maturation and seizure recurrence. Additional evaluation through neuroimaging and EEG might demonstrate progressive change and allow retrospective risk analysis. Neuroimaging should be strongly considered in children having abnormal EEG, though the patients having normal EEG can be safely discharged without neuroimaging, if follow-up is assured. Abnormal EEG in partial seizures increases the risk of having abnormal neuroimaging. But normal EEG in partial seizures does not rule out having an abnormal neuroimaging. In case of generalized seizures, patients with abnormal EEG may have abnormal CT/MRI scans. But there are fewer possibilities of a patient with abnormal neuroimaging to have a normal EEG. When EEG is abnormal in first unprovoked seizure, the probability of having abnormal neuroimaging increases as compared to those cases where EEG is normal. A seizure in the setting of fever rarely indicates the presence of an unexpected lesion on neuroimaging. MRI has no advantages over CT scan in diagnosis of the first episode of CFS. Our findings indicate that clinical examination and EEG results are good indicators for neuroimaging, and these can be used as one of the criteria for ordering neuroimaging in new-onset seizures, more so in partial seizure than generalized seizure. 1. Pohlmann-Eden B, Beghi E, Camfield C, Camfield P. The first seizure and its management in adults and children. BMJ 2006;332:339-42. 2. Hirtz D, Ashwal S, Berg A, Bettis D, Camfield C, Camfield P, et al. Practice parameter: Evaluating a first nonfebrile seizure in children: Report of the quality standards subcommittee of the American Academy of Neurology, the Child Neurology Society, and the American Epilepsy Society. Neurology 2000;55:616-23. 3. Camfield PR, Camfield CS, Dooley JM, Tibbles JA, Fung T, Garner B. Epilepsy after a first unprovoked seizure in childhood. Neurology 1985;35:1657-60. 4. Sharma S, Riviello JJ, Harper MB, Baskin MN. The role of emergent neuroimaging in children with new-onset afebrile seizures. Pediatrics 2003;111:1-5. 5. Schoenenberger RA, Heim SM. Indication for computed tomography for brain in patients with first uncomplicated generalized seizure. BMJ 1994;309:986-9. 6. Ramirez-Lassepas M, Cipolle RJ, Morillo LR, Gumnit RJ. Rate of computed tomographic scan in the evaluation of adult patients after their first seizure. Ann Neurol 1984;15:536-43. 7. Simone CV, Paulo Breno NL, Monica JS, Adriana BO, Alaides SFO, Alfredo LJ. First unprovoked seizure: Clinical and electrographic aspects. J Epilepsy Clin Neurophysiol 2006;12:69-72. 8. Shinnar S, Kang H, Berg AT, Goldensohn ES, Hauser WA, Moshé SL. EEG abnormalities in children with a first unprovoked seizure. Epilepsia 1994;35:471-6. 9. Al-Sulaiman AA, Ismail HM. 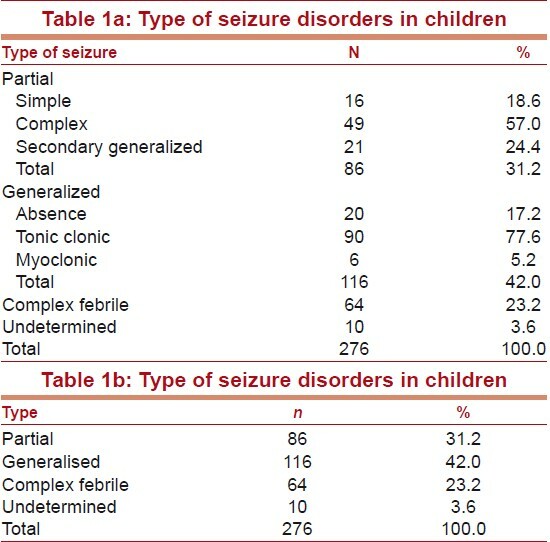 Clinical pattern of newly diagnosed seizure in Saudi Arabia: A prospective study of 263 children. Childs Nerv Syst 1999;15:468-71. 10. Doose H, Lunale H, Castiglione E, Waltz S. Severe idiopathic generalized epilepsy of infancy. Neuropediatrics 1998;29:229-38. 11. Baheti R, Gupta BR, Baheti R. A study of CT and EEG findings in patients with generalized or partial seizures in western Rajasthan. J Indian Acad Clin Med 2003;4:25-9. 12. Doescher JS, deGrauw TJ, Musick BS, Dunn DW, Kalnin AJ, Egelhoff JC, et al. Magnetic resonance imaging and electroencephalographic findings in a cohort of normal children with newly diagnosed seizures. J Child Neurol 2006;21:491-5. 13. Gilbert DL, Buncher CR. An EEG should not be obtained routinely after first unprovoked seizure in childhood. Neurology 2000;54:635-41. 14. King MA, Newton MR, Jackson GD, Fitt GJ, Mitchell LA, Silvapulle MJ, et al. Epileptology of first seizure presentation: A clinical, electroencephalographic and magnetic resonance imaging study of 300 consecutive patients. Lancet 1998;352:1007-11. 15. Joshi C, Wawrykow T, Patrick J, Prasad A. Do clinical variables predict an abnormal EEG in patients with complex febrile seizure? Seizure 2005;14:429-34. 16. Maytal J, Steele R, Eviatar L, Novak G. The value of early postictal EEG in children with complex febrile seizure. Epilepsia 2000;41:219-21. 17. Holmes GL. How to evaluate the patient after a first seizure. Postgrad Med 1988;83:199-209. 18. Landfish N, Gieron-Korthals M, Weibley RF, Panzarino V. New onset childhood seizures. Emergency Department experience. J Fla Med Assoc 1992;79:697-700. 19. Garvey MA, Gaillard WD, Rusin JA, Ochsenschlager D, Weinstein S, Conry JA, et al. Emergency brain CT in children with seizures: Who is most likely to benefit? J Pediatr 1998;133:664-9. 20. McAbee GN, Barash ES, Kurfist LA. Results of CT in "neurological normal" children after initial onset of seizure. Pediatr Neurol 1989;5:102-6. 21. Berg AT, Shinnar S. The risk of seizure recurrence following a first unprovoked seizure - A quantitative review. Neurology 1991;41:965-72. 22. Berg AT, Testa FM, Levy SR, Shinnar S. Neuroimaging in children with newly diagnosed epilepsy: A community based study. Pediatrics 2000;106:527-32. 23. Maytal J, Krauss JM, Novak G, Nagelberg J, Patel M. The role of brain computed tomography in evaluating children with new onset of seizures in the emergency department. Epilepsia 2000;41:950-4. 24. Bachman D, Hodges PI, Freeman JM. Computed axial tomography in chronic seizure disorder of childhood. Paediatrics 1976;58:356-67.